Status Quo are a British institution with a raft of hit albums and singles. They've endured line-up changes and survived internal rifts, which they put to bed when leaders Francis Rossi and Rick Parfitt teamed up with original members Alan Lancaster and John Coghlan for the 'Frantic Four' tour earlier this year. It was always a 'one tour only' deal with the current line up of Rossi, Parfitt, keyboard player Andy Bown, bassist John 'Rhino' Edwards and drummer Matt Letley staying together and planning a new record. 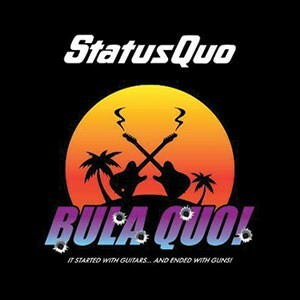 What fans didn't know at the time is that the new record would be 'Bula Quo', a double album which serves as a soundtrack to the band’s very first feature film, an action comedy set in Fiji. The film is daft and amusing with Quo being pursued by villains after witnessing a game of Russian Roulette, but the music used in it is first class, meaning the 'Bula Quo' record is well worth a listen. Nine original songs were written for the film, lyrically tied to key scenes in the movie. 'Looking Out For Caroline' is a classic Rossi opener with an infectious hook in the chorus. Unusually, Rossi's often dominant writing is absent; here he only weighs in with two tracks. Rhino is prevalent throughout the album, providing some great high backing vocals on the Andy Bown penned rocker 'Never Leave A Friend Behind', writing the reggae themed 'Fiji Time' and singing lead on 'The Gun Song'. Matt Letley composed the Rossi sung 'Running Inside My Head' and Rick Parfitt is responsible for the rest, spanning the rockers 'GoGoGo' and 'All That Money' to the superbly crooned tropical ballad 'Mystery Island'. While some fans hate the lead single 'Bula Quo', what needs to be stressed is the album is essentially a soundtrack. However, unlike Queen's 'Flash Gordon' for example, these are full standalone songs, not ambient cinematic music. 'Bula Quo', 'Mystery Island' and 'Fiji Time' may represent a departure but are superbly performed and work perfectly in the film. The rest are great rockers which Quo do so well. Disc two offers a reworking of 'Living On An Island', a new version of 'Rocking All Over The World' with a longer intro, two tracks taken from 'Quid Pro Quo' and some live material from 2010 which is also used in the movie. I was less interested in disc two because I enjoyed the originals so much, but either way, 19 songs with no background music in sight, for a soundtrack, is value for money. It'll be a marmite album, some will love it, some will hate it. I love marmite and I love this!